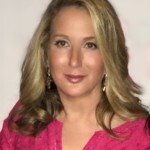 King Cake Ice Cream, King Cake Cocktails, King Cake Macarons, a King Cake Festival and… King Cake Burgers? NOLA chefs and bartenders have jumped on the King Cake bandwagon, and nothing is sacred. Locals—who are game for most anything—are documenting the King Cake craze with enthusiasm. If Instagram excels at anything, it’s the cataloging of what we eat. And New Orleanians love to eat. 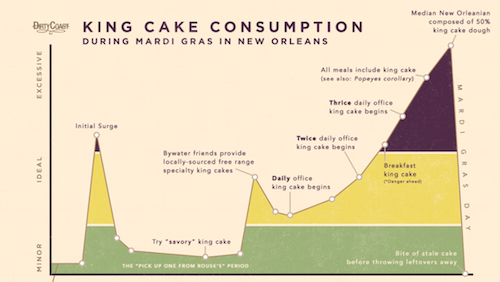 From Twelfth Night onwards, NOLA eats King Cake. A lot of King Cake. Masses of King Cake. Everywhere. Dirty Coast is even selling a King Cake Consumption poster and King Cake T-shirt. The Cake of Kings, the elegant Galette des Rois, is creating a cottage industry heretofore unseen in New Orleans. Sucre’ has the King Cake Macaron, The Ruby Slipper Café has a King Cake Cocktail (it sounds quite good). Yes, we do have King Cake vodka (but I refuse—for now anyway), and Mudbugs previously made a King Cake Ale. PJ’s and CC’s have their King Cake Lattes. Abita sells a non-alcoholic King Cake soda. 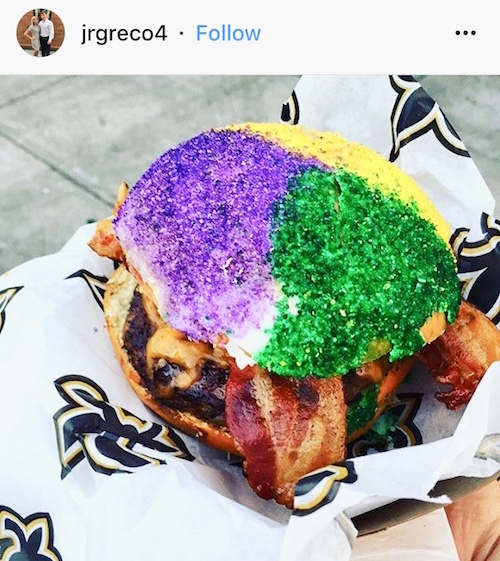 Mid-City’s Frey Smoked Meat Co. has a King Cake Milkshake, and Kenner’s Jats Cafe and Gentilly’s Tasty Treat Food Truck are offering a King Cake burger—but that would first require an Uber and the King Cake vodka. Savory King Cakes bring out the beast in purists, although Cavan’s Crawfish King Cake recently met with Ian McNulty’s approval. I’m not ready yet. King Cake donut and baby from District Donuts. The most amazing IG photo so far was District Donuts. But call first; they rotate selections. However, they are now baking and selling whole King Cakes with Satsuma and Matcha-infused icings. None of these are to be outdone by the aesthetic ingenuity of Hi Do Bakery in Terrytown with their Fleur de Lis and Lobster-shaped King Cakes. The bakery is solid and authentic French Vietnamese. Breaux Mart has changed their Twitter handle to King Cake Mart, and say they are restocking Blue Bell King Cake Ice Cream as fast as they sell it (baby on board). Smoothie King has, yes, a King Cake flavored Smoothie—”Fit for a King” and less than 350 calories. I’m not sure about that one; they may be missing the point. King Cake Burger from FoodDrunkNola food truck who are scheduled to appear at The King Cake Festival this Sunday. Lakeview’s Pizza Nola delivers King Cake. 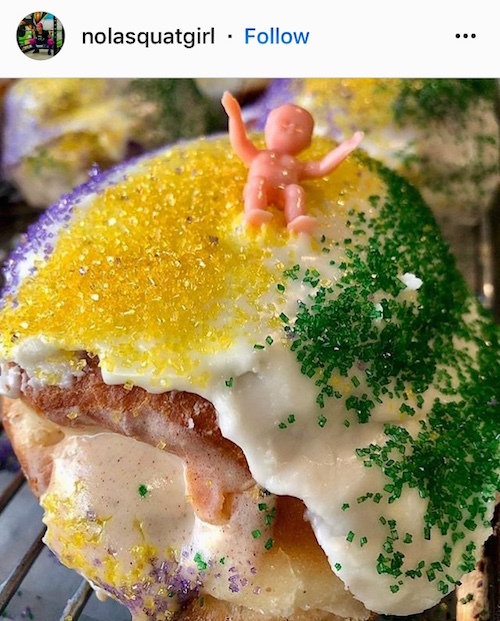 In fact, a King Cake discussion without mention of the popularity of New Orleans East’s Dong Phuong’s Bakery would be remiss in King Cake circles. New Orleans Cookbook author Judy Walker declared it “most delicious” of 2018. The light cream cheese, notched-edged cake is sold out daily, so call first or order early. 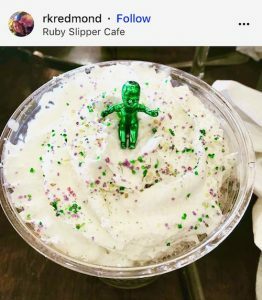 The King Cake Cocktail made from Horchata Rum Liquor from The Ruby Slipper Cafe. Nostalgia Corner: My favorite King Cake? The King Cake of childhood, of course. McKenzie’s, freshly delivered to grammar school class by our moms. That three-foot ring of unfilled cake on a cardboard platter—served on cafeteria (or lavatory) napkins. The faux terror and excitement of waiting to see if you got the baby. Colored sugar spilled on uniforms and our desks (then added to a few shoebox Mardi Gras floats). King Cake. Mark your calendars, this Sunday we have the 2018 King Cake Festival in Champions Square featuring over two dozen bakeries, music, and family fun run at 8 a.m. benefiting Ochsner’s Hospital for Children. http://kingcakefestival.org. Advertiser: 1 of 1 Blazers Gives You an Outfit that Makes a Statement Advertiser Special: Be Thoughtful, Ship a King Cake!